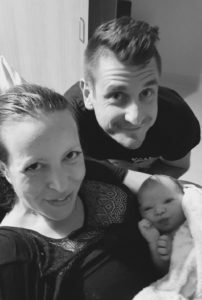 You are here: Home / Testimonials / I hadn’t even realised I was in labour! A massive thank-you for introducing me to the wonderful world of hypnobirthing! 5 weeks ago my husband and I welcomed baby Betty into the world after an incredibly calm and gentle birth. I’m so excited that one day I will be able to share with my daughter her positive birth story. I hadn’t even realised I was in labour! On Betty’s birthday we took the dog for a walk in the forest, watched some TV, hung out, my husband went and bought us a yummy dinner. I thought my surges were Braxton Hicks so did my hypno breathing and got on with the day! I did call the hospital to ask whether it could be prelabour but they said, ‘no, you’ll know when you’re in labour’ somewhat sarcastically! That night things speeded up so we went to the hospital and Betty arrived 2 hours later wide eyed and super calm. No tears! There were no medical staff in the room, they later confessed that because the room was completely silent they assumed I wasn’t at the business end of things! I’m so pleased I chose this path and put the practise in. You and your partner will need the help of an amazing professional like Melissa to guide you. Don’t think you can just read a hypnobirthing book. Through attending classes we learnt how to rethink how we thought about birth and gained skills like self hypnosis, relaxation techniques, acupressure, breathing exercises, visualisation, the power of positive affirmations and much more besides. It’s incredibly empowering for you and your partner and is the perfect way to start your journey as parents. Betty is the most gorgeous chilled out baby. She loves listening to my hypnobirthing tracks I assume because she heard it every day in my tummy. We couldn’t love our hypno bub anymore.